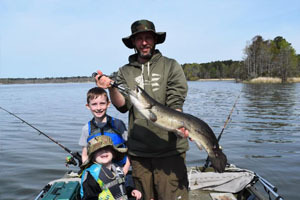 While fishing with his family in Lake Moultrie, South Carolina, U.S. on March 27, 2018, angler Kyle Thomas caught and released this bowfin (Amia calva) that measured out to 79 cm - long enough to qualify him for the potential new All-Tackle Length world record. Thomas was using chunked herring for bait and needed only a few minutes to subdue the fish. 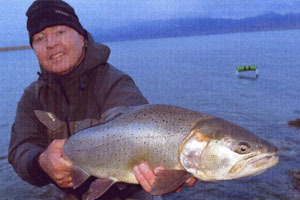 The current IGFA world record is 77 cm. Angler Bob Gaines potentially set the new men's 2 kg (4 lb) tippet class world record for cutthroat trout (Oncorhynchus clarki) with this 4.08-kilogram (9-pound) fish that he caught and released on March 15, 2018 while fly fishing Pyramid Lake, Nevada, U.S. Gaines played the fish for approximately 10 minutes after it ate the Mahalo nymph he was casting. The current IGFA world record is 3.63-kilograms (8-pounds). 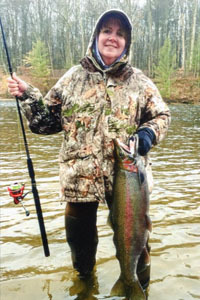 Angler Elyse Romano caught and released this 4.98-kilogram (11-pound) rainbow trout (Oncorhynchus mykiss) while fly fishing the Muskegon River in Michigan, U.S. on March 27, 2018. Romano needed approximately 10 minutes to land the fish after it ate the egg sack she was using for bait. 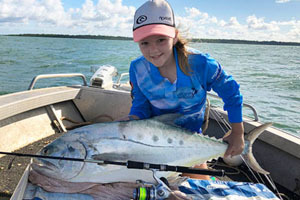 If approved, the catch will earn Romano the new women's 6 kg (12 lb) line class world record, which currently stands at 1.53-kilograms (3-pounds, 6-ounces).